The greatest of all time versus the greatest of the future? Is that what we are really looking at here. In the wake of the Indianapolis colts releasing Peyton Manning after over a decade of service, the question for me is… What the LUCK is going on here? Can you really tell that much about a player and how he will fair in the NFL by watching a couple of seasons of NCAA football, timing a spandex-laden sprint, and measuring how high one can jump in a sport where his position will probably never be required to jump? Do these measurements outweigh what a tried and tested veteran has done for an organization for over 10 years? 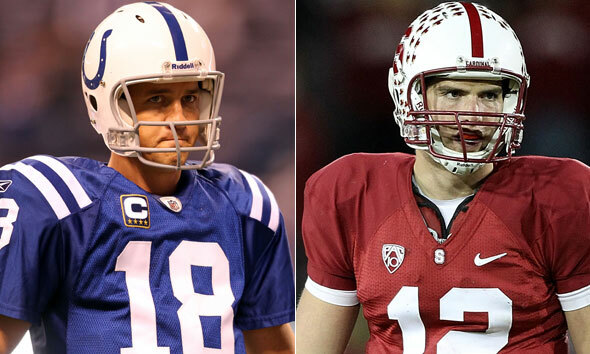 Listen, i know the money and injury status were an issue, but if Peyton Manning was throwing as well as they have said he was, why wouldn’t you keep him to mentor Andrew Luck for a few seasons (see Green Bay and Favre/Rogers)? It seems to me these days too much stock is put into how players perform at a combine, or a private “audition” day where they are put into position to look good. It’s like a beauty pageant, everybody always looks their best. You ever wonder why they don’t hold beauty pageants at 7 a.m. in the morning? Exactly, nobody wants to judge a bunch of bag-eyed, birds nest haired, gravel voiced beauties who collectively could make it look like an episode of Zombieland. So why does the NFL put so much stock in the combines, wonderlic test, and how well one interviews. I’m sorry, I’ve been to a handful of job interviews and never been asked to sprint down the hallway to see how quickly i could help vacate the building if a fire broke out. Wouldn’t you think that on field performance should outweigh some classroom tests, whether or not a player can jump across a stream from a still position,or how much eye contact they make during a discussion? With as much money that will be spent on a player of this stature, I would like to have some real grid iron, battle tested, playing performance time from which to measure. Too many “sure things” have come and gone and fallen by the wayside due to putting too much stock in these off field measurements (hello Ryan Leaf). And at the end of the day, who takes the fall? The General Manager? Director of Player Scouting? No, its the coach who didn’t want the “sure thing” in the first place, who wanted the trusty veteran who knew how to run their program. So when does Loyalty succumb to Royalties? How do you take a player like Peyton Manning and tell him, thank you for all you have done… the Super Bowl win… the new multi hundred million dollar stadium… all the revenue you have brought this city… but, the next big thing is here and we no longer need your services. Not even, a “hey, we are going to keep you, and you are going to mold this young kid to be your heir apparent”. Just a “thanks, here’s your gold watch, thanks for all you have done”. A true slap in the face to a player who has never been anything (in my eyes) but the consummate professional. Obviously I don’t know what went on behind closed doors, but you would think after all that time that the overall body of work Manning has put in he would have been given the option to stay if he wanted. Lastly, i don’t know what size shoe Andrew Luck wears, though I am surprised it wasn’t on the NFL combine scouting report… but don’t you think he has some huge shoes to fill here? Having to replace what is possibly the most important player to ever be a part of a professional franchise minus Michael Jordan. This is almost a lose/lose situation. Andrew luck could win 14 games a season and never win a Super Bowl and he’ll be looked at as a failure to all the Manning lovers in Indy. And I don’t think that would be the case if they kept Manning to bring Luck along slowly and show him the ropes. When you cut ties like this with a player that has meant so much to a team, there is always going to be a little bit of a bitter taste in peoples mouths… whether fair or not. So, what do you think? Should we just accept the new norm of putting so much stock in the “what ifs” and not so much in the “they dids”? Weigh in folks… just make sure you don’t tip the scales, or your NFL future will surely be affected. This entry was posted in sports and tagged andrew luck, draft, indianapolis colts, nfl, peyton manning, quarterback, sports. Bookmark the permalink.